Jennifer Nielsen is freakishly prolific. In the fairly recent past, she has sold two trilogies–yes, math wizards, that means six books. And she’s here today celebrating the release of ELLIOT AND THE PIXIE PLOT, the second book in The Underworld Chronicles series. Without further ado, here’s Jennifer, talking about evolving relationships, characters knocking on the door inside her head and literary friendships. Oh, and Yoda. 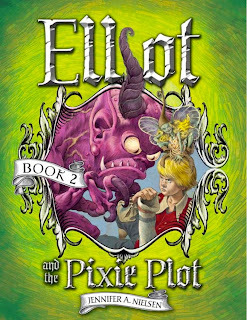 In the Kirkus review of ELLIOT AND THE PIXIE PLOT, in addition to praising the book as a “quickly addicting page-turner,” it’s also noted that “Elliot learns how to navigate some difficult relationships and appreciate the better qualities in unlikely allies.” As a literary friendship kind of girl, that delights me. Can you talk about what it was like to write about and develop the relationship between unlikely allies? In PIXIE PLOT, Elliot is kidnapped to the Underworld by a mischievous Pixie named Fidget Spitfly. She is self-centered, selfish, and entirely unsympathetic to all of the trouble she causes for Elliot. However, as the series evolves, Elliot will learn how to manage her trouble-making, and also come to understand that he needs her strengths to survive the challenges of being an Underworld king. I think it’s fascinating to write about evolving relationships, about people who have to learn how to come together for whatever reason. So much character is revealed when this is a facet of the story. I know you are a fast, prolific writer. (Duck–people are going to throw things.) What role, if any, do writer-friends play in your writing life? To start, let me say that I’m not really fast as much as I’m obsessive. When I get an idea that I love, I cannot tear away from it. It’s like the characters keep knocking on this door inside my head until I finish the writing. I’ve had two critique partners for about ten years, and we worked very well together because we each brought different skills to the group. Sadly, one of the partners passed away late last year. However, I’m sure that without my critiquing partners, I would not be where I am today. They never allowed me to give up, and made me a better writer. Was there a fictional character you wished was your friend? Were there any in-books friendships you envied? Growing up, I was a huge fan of THE WOLVES OF WILLOUGHBY CHASE by Joan Aiken. I loved her protagonist, Bonnie Green, who was spunky, fiery, and bright. Having her for a friend would have been wonderful. In the book, Bonnie’s cousin, Sylvia, comes to live with her and there the adventure begins. When the cousins are put under the care of the horrible Miss Slighcarp, the girls’ friendship solidifies in a beautiful way. They also make friends with the goose-boy, Simon. The three children need each other and use their individual strengths to help the others survive a terrible situation. One of the major reasons this was my favorite childhood book is because of the friendships there. If you could insert another fictional character, one you didn’t write, into Elliot’s world, who would it be and why? “That’s really not necessary,” Elliot said. Before Elliot could step between them (and let’s be honest, it’s a good thing he didn’t! ), the full power of the force slammed into Dobby just as some illegal Elf magic hit Yoda. And thus ended the careers of hundreds of 3-D movie animators. Not to mention ending Dobby and Yoda’s strange and literally short lives. Actually, on second thought, I don’t think this would be the best literary friendship. I think I’ll just keep my own characters for Elliot’s story. Thanks for a fun interview, Audrey! Check out more of Jennifer’s interviews on Peter Salomon’s blog and the EMU’S Debuts blog. This entry was posted in Uncategorized and tagged Bonnie Green, Dobby, Elliot, Elliot and the Pixie Plot, Fidget Spitfly, Jennifer Nielsen, Joan Aiken, Pixie, The Underworld Chronicles, The Wolves of Willoughby Chase, Yoda. Bookmark the permalink. Oooh. I really adored THE WOLVES OF WILLOUGHBY CHASE, too. But I’m among the writers who would be tempted to throw things if I weren’t waiting or the next book….